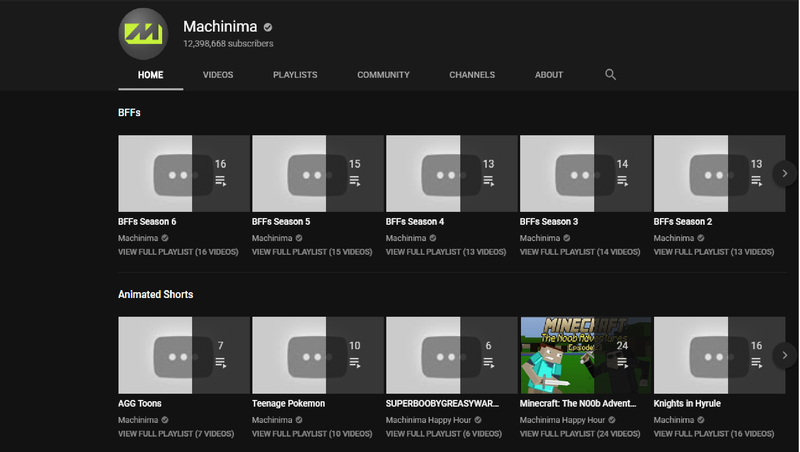 With no public announcement or advanced warning to many creators, the entire Machinima Youtube channel was effectively wiped from the internet recently. All videos on the channel are now private, making them unable to view. The news quickly spread across social media, with fans and creators sharing their stories and information about the shutdown using the hashtag #RIPMachinima. News of the videos began to spread yesterday, but it’s unclear when the switch to private happened. Many creators seemed not to have been aware that their videos would be set to private. “Otter Media really just went and deleted Machinima, Happy Hour, Respawn, Realm, Prime, Inside Gaming, ETC, everything.” Jeremy Azevedo, a former creator and employee of Machinima tweeted after learning about the news. Other former creators were shocked to find years of videos now gone. KhailAnonymous, a former creator at Machinima tweeted,“Wow y’all making me emotional with #RIPMachinima”. “Sad to see the catalogue go. As many have already said Machinima was a special place filled with amazing people,” said former creator Matt Dannevik. Back in December 2018, AT&T moved Machinima under their Otter Media brand in a restructuring that also saw layoffs across Otter Media. Otter Media is made up of other companies, including streaming services like VRV and Crunchy Roll. In early January, shortly after the restructuring, long time Machinima creators like Maximilian Dood were let go. Other creators were let go or sent letters informing them they were being moved to Fullscreen, another media company founded in 2011 which is also owned and operated by Otter Media. For many fans, the news feels like the end of an era. One of the old YouTube giants now gone. “I cannot begin to understand the motivation behind nuking every official Machinima channel... That’s like 7 years of core gaming content, gone forever,” one fan tweeted. “It’s so weird now that I’m going to be a part of that generation of people that will say, ‘remember Machinima?’” wrote another. Using the #RIPMachinima hashtag, others reminisced about their favorite creators and derided the decision to set the channel to private. What will happen to the Machinima channel and all of its videos is unknown at this time. The channel currently has 12.3 million subscribers. Kotaku has reached out to Machinima for comment. Variety confirmed that Machinima is officially shutting down and laying off 81 staff members. “Machinima has ceased its remaining operations, which includes layoffs,” explained Machinima owner Otter Media in a statement to Variety.